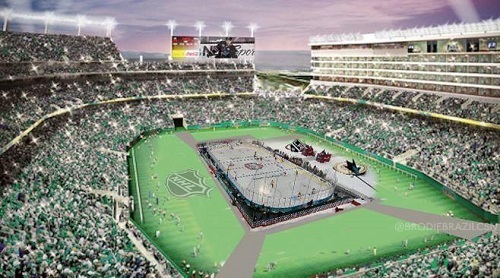 After months of guessing where and if the Sharks will have an outdoor game, the NHL finally put all the guesses to rest. Today the league announced that San Jose will matchup with the dreaded Los Angeles Kings on February 21, 2015 at 7:00 PM in Santa Clara at Levi’s Stadium, home of the NFL’s San Francisco 49ers. Sharks’ COO John Tortora said that Levi’s was chosen because of better sightlines, and because tickets will be cheaper due to there being more seats, almost 69,000. He also admitted that selling out the stadium is not a major concern. Tickets will range between $65 and $350, and Sharks season ticket holders, as well as 49ers season ticket holders will be able to purchase them starting August 7th. They will be available to the general public at a later date that is TBD. Also, unique jerseys will be worn by both teams. It is unknown when they will be announced. Levi’s Stadium will be busy in the near feature. It’s scheduled to host the Super Bowl in 2016, Wrestlemania in 2015, as well as games for the San Jose Earthquakes, and college football.